Turns 1-2 Cygnar: Cygnar placed first, so the Cryx player put the bonejacks across from the gun mages and the ban thralls across from the precursor nights. 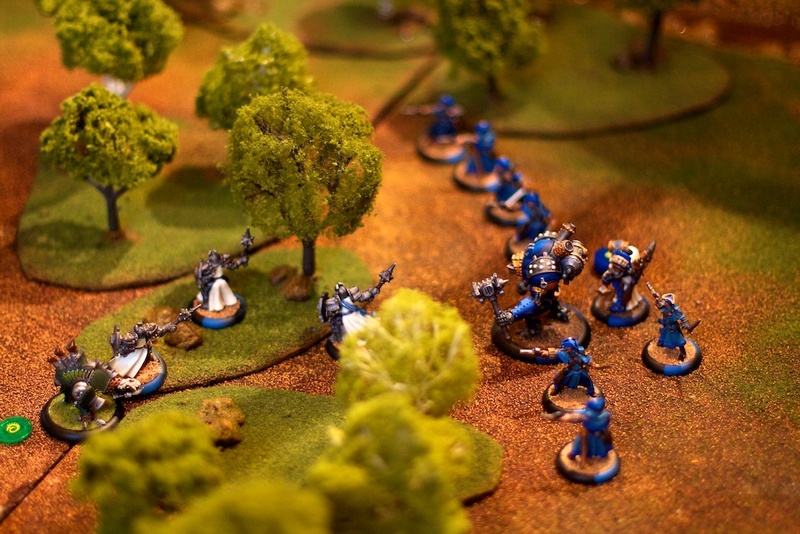 Turn one Cygnar was basically advancing to the forest and switching positions between the gun mages and precursor knights. 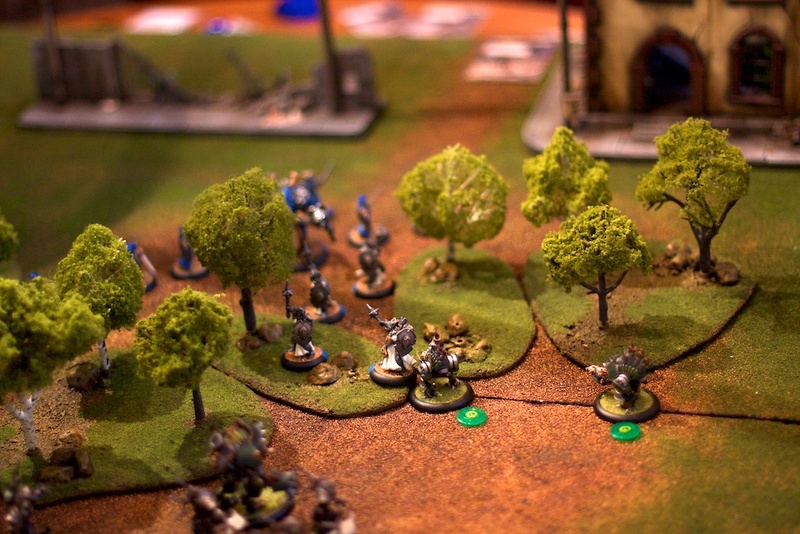 Turns 1-2 Cryx: Cryx advanced to put the bonejack arc-nodes into position, ready to venom spray span the forests. Turns 3-4 Cygnar: A Precursor knight was able to engage the deathripper in melee and actually did some damage. Because of the copious forests, none of the other precursors were able to close on the bonejacks and engage them (and thus take their arc nodes out of play). 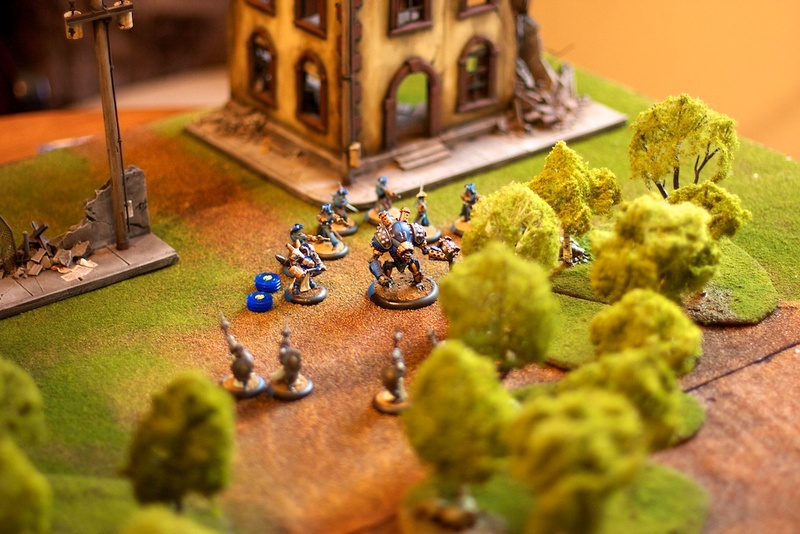 The gun mages successfully formed a firing line, and between them and sieges ‘ground pounder’ special attack, all but one of the bane thralls were eliminated. One precursor knight tried to dis-engage the deathripper and move to engage the defiler (removing both it’s arc node and spray attack from play as it’s engaged in melee) and had a 2:3 chance of surviving the freestrike to successfully engage the defiler. 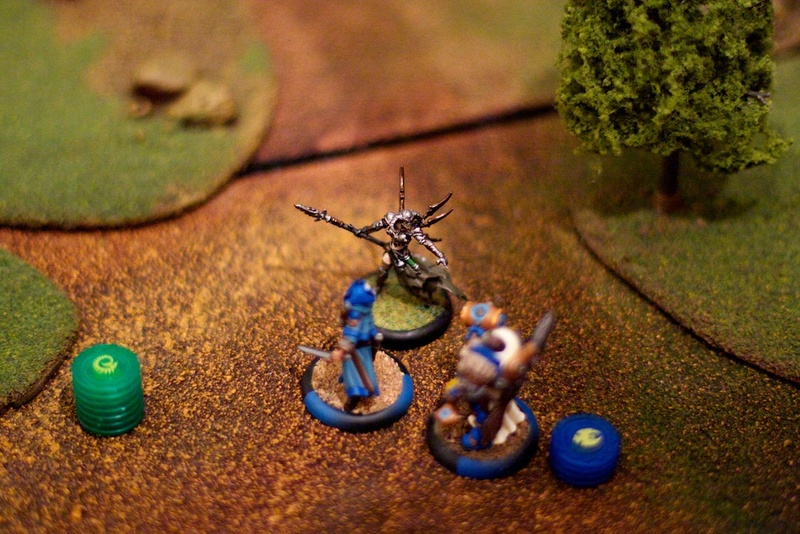 The cryx player got the role, and took out the knight, thus regaining both arc nodes. On turn 4, the ironclad advanced between the two bonejacks and laid down a tremor, knocking both of them down. He then attacked the deathripper and hit, but whiffed the damage role. The Gun mages damaged but didn’t disable the defiler. Turns 3-4 Cryx: After surviving the engagement with the precursor knights, the deathripper & defiler took out the remaining precursors and one of the gun mages handily. The slayer began a flanking maneuver around the forest, and the remaining Bane Thrall ran into the forest and chilled out there all alone. 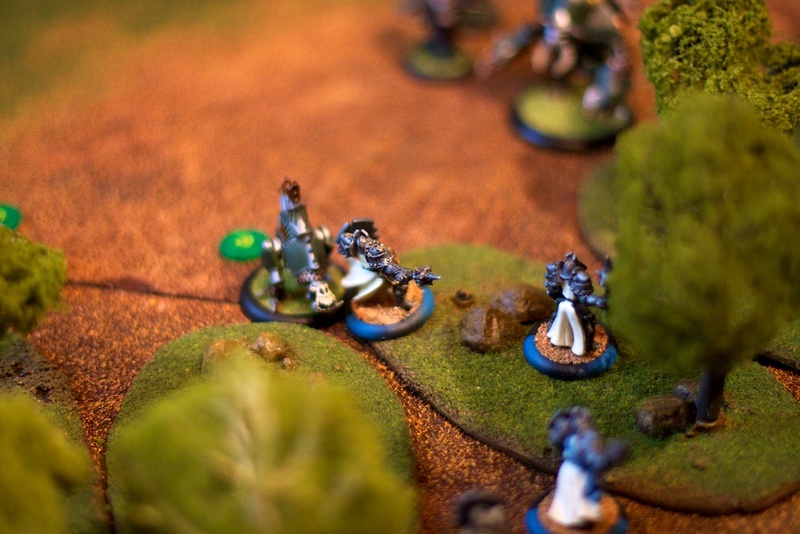 Deneghra was allocating focus to the jacks so they could stand up after the knock down and do their dirty work while positioning herself near the Cryx edge of the forest. 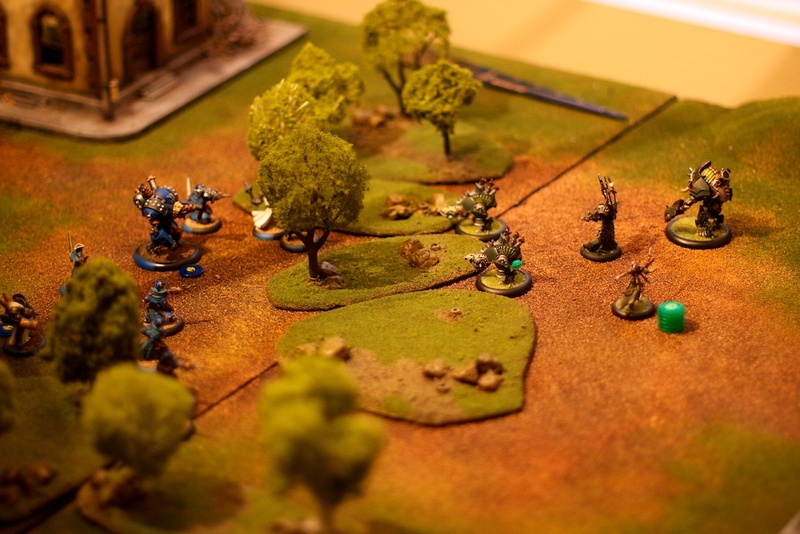 Turn 5 Cryx: The defiler with it’s high speed was able to run through the forest and position itself as an arc node within Denegrah’s venom spell spray attack of the bulk of the gun mage firing line. Deneghra first moved back out of Siege’s range, camped her focus, and then spam venom attacked the gun mages, taking out 4 of them (two remaining) who failed their command check by one point and fled. The slayer continued its flanking movement around the forest, and the remaining bane thrall basically continued to chill in the forest alone. Turn 6 Cygnar: The ironclad again beat on the deathripper, leaving it with one point of life remaining. Siege didn’t move, and threw out his special attack again, killing both the severely damaged deathripper and the remaining bane thrall. Turn 6 Cryx: Deneghra fell back and healed, The slayer actually reversed it’s 2 turn flanking maneuver and headed back to the center of the board. The defiler attacked either Siege or the Ironclad, hit, but failed to damage. Turn 7 Cygnar: Siege’s special attack took out the defiler, the single remaining gun mage rallied and headed back into the fight. The ironclad fell back a few inches. 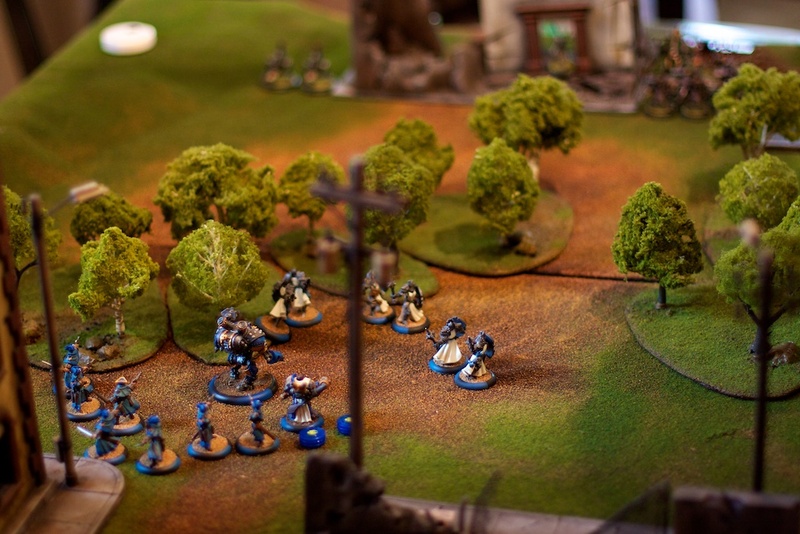 Turn 8 Cygnar: Siege moved forward, ready to assault Denegra with his special attack. The gun mage did the same. 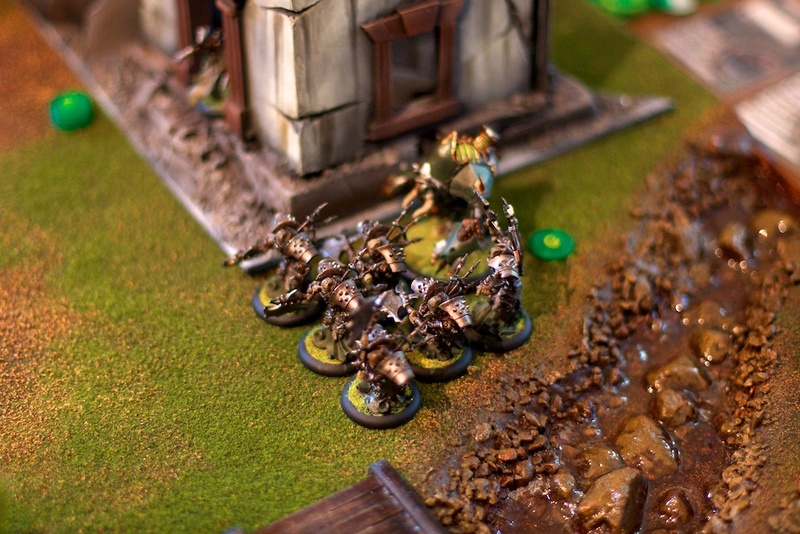 Turn 8 Cryx: Deneghra ghost walked through the forest and engaged Siege in Melee!!! She has reach + a special effect with her melee weapon called ‘Crippling grasp’ the immobilizes the opponent hit by the melee attack. While Siege was camping focus and had high armor, the attack didn’t do ‘that’ much damage, but it did immobilize him! Turn 9 Cryx: Deneghra moved into line of site, and spam melee attacked Siege. While Siege had high armor (camping focus) each attack re-immobilized him and did some damage with boosted rolls. 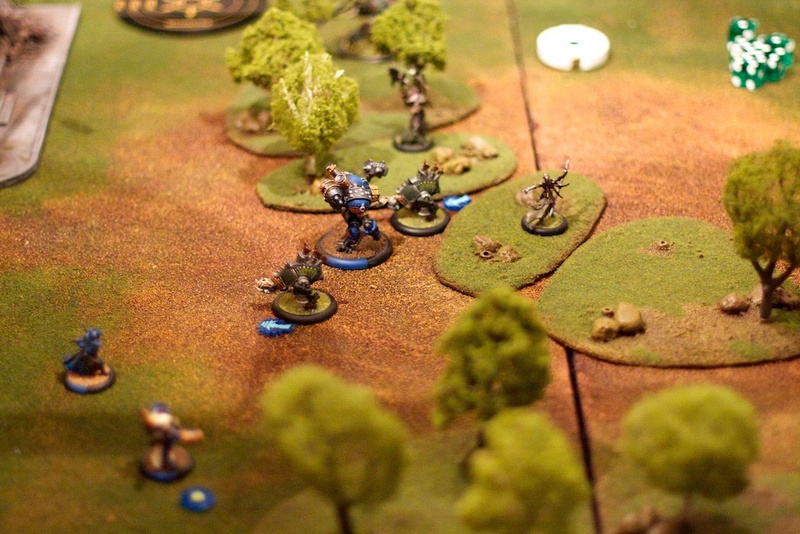 Turn 10 Cygnar: Siege has no options, can’t move, can’t attack Deneghra, so concedes the game. If only he had a single offensive damage causing spell! DOH! Game over. This entry was posted on June 8, 2011 by justinhardin. 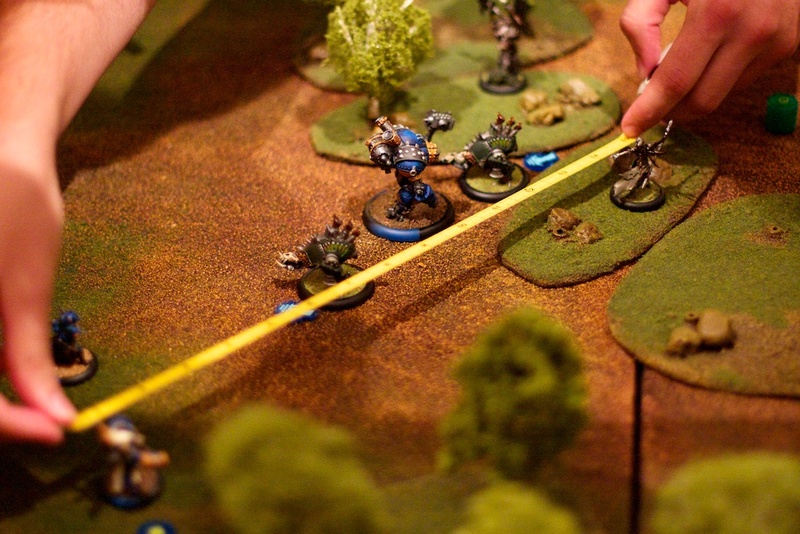 It was filed under Battle Reports, WarMachine . Why didn’t you just Force Hammer her to slam her out of melee and then shoot her in the face while she was knocked down? Holy Cow. For some reason (after 2+ hours of this game) I was thinking that was somehow something I basically attached to my melee weapon, which didn’t have range on Deneghra with reach. After re-reading the spell (thanks to your post!) I realize it’s just a normal spell, that I could have cast it on Deneghra, and probably would have won the day. Jeeeze, no-wonder I keep loosing to him, as I keep making stupid mistakes. Thanks for the pointer!